Bogey on your six. And a plane behind you, too. 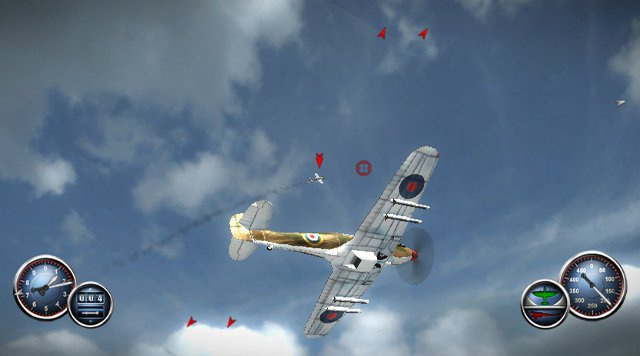 City Interactive's arcade dogfight game Combat Wings is approaching the Wii runway later this year, and the latest screenshots of the game don't look too shabby. The game was originally due for release last year but was delayed to make way for a release on other formats including PlayStation Move. Hopefully its arcade gameplay will help it stand out in the field of Wii dogfighting games currently led by Pearl Harbor Trilogy – 1941: Red Sun Rising. Reviews will tell me what I need to know. I am really looking forward to it, was disappointed it was not released last year as it was first intended, was even afraid the game was cancelled. If they make the 4 player split screen smooth, I surely see longevity in this one. Well, there are also the Rogue Squadron GameCube games, but I too hope this turns out well to help fill out this subgenre on the Wii. Its sad that you consider those sh*tty Wiiware Pearl Harbor games to be the pinnacle of Wii dogfighting, Nintnedolife. MySims Sky Heroes, Heatseekers and OF COURSE Sky Crawlers (play it with the classic controller) are much better games. Heck, Kid Adventures Sky Captain looks better than those Pearl Harbor games were like. This looks interesting, but I'll probably stick to PC for my flight sims. I don't know how those other games compare, but I found the Pearl Harbor WiiWare game to be very good. I wish Legendo would release the other two on WiiWare.